It's been a while since I've posted video, so I figured I'd put some up for people to practice MA on. I had a much shorter season than I planned on this year, only 4 total ski days. Despite this, I was more fit this season than I have ever been due to a workout program I've been on for the past year. I got new boots [Lange RS 140] at HSS at the end of last season. I have about 7 days total on the new setup, and it has taken a lot of adjustment and getting used to. My previous boots were Nordica Dobermann Aggressor WC 130s, which have an extremely abducted stance. Most of my PMTS learning had taken place on those boots, and going back to a "straight" boot was a major change. The abducted boots were acting as a crutch to hide some balance issues that were present in my skiing. In particular, my formerly narrow stance now has a tendency to go way too wide. This video was taken at Taos on the morning of my second day of the season, in late March. I was still a bit rusty and remembering the balance; it's not my best skiing. The conditions were spring refrozen on a race-prepped trail, it was an eastern-like surface before the sun hit it. I'm on 180 Hart Pulses, 16m radius 77mm waist. SMIM, as it has been for a few seasons, is tipping. The overly wide stance stands out in the early turns of the video, and there is very little high-C tipping. This results in somewhat of a hip dump and lack of ski performance in the turns above the camera. As I skied past the camera I narrowed up some and began to focus on tipping. This resulted in improved ski performance and tighter turns. I need more ski days and more time on the new setup to make improvements; I hope to get to a camp soon. I sent you a PM with more details. You may want to experiment with left boot lateral alignment if you get a chance to ski with Heluvaskier or a video camera next season. Taos is a special place. My only complaint is that you didn't catch some film skiing upper Stauffenberg. Not for MA, just because that is one of a handful Of truly great, named and known in bounds run in North America. It's right up there with High Rustler. Love Taos and looks like you hit it in good conditions. Hi SFDDS. Your skiing is coming along nicely. I'll give you two suggestions. 1) More flexion and tipping of the stance leg/foot at the end of the turn. In the middle of the turn, you have great inside leg flexing and tipping which is resulting in a large amount of vertical seperation. However, you have to (through continuing to flex and tip at the end of the turn) allow the stance ski to track back upwards (relative to the slope) or inwards (relative to the arc) so the skis come back together and you can release from an narrow stance. You'll notice some turns where your stance width at release is greater than hip width. You'll also notice that when that happens you have to lean your upper body and extend your new stance leg to get your hips to move into the turn because they are being blocked by the a-framed stance leg. That puts you momentarily out of balance and delays the start of your tipping. Work on power releases from Essentials, one arc to a stop at a time. Your task is to ski your feet back together by the time you come to a stop. Then graduate to linking them, but you'll need video (or Heluva) to confirm that your feet are coming back together. Remember kids, you don't need a wide stance to build large tipping angles! 2) Work on holding your poles with your knuckles (especially the kuckle on the first finger) facing up towards the sky. You tend to point the knuckles of your outside hand downward (like you are holding a briefcase). This causes the tip of that pole to drop way back behind you which requires you to make a large movement to bring the basket back to the front for the next pole plant. If you can keep the pole baskets from dropping back, you will end up with even better forward balance throughout the turn as well as limiting the necessary pole movements to the wrist only--which will help ensure that your pole plant isn't detracting from your overall balance. Last edited by geoffda on Mon Sep 18, 2017 6:24 pm, edited 1 time in total. geoffda wrote: You'll notice some turns where your stance width at release is greater than hip width. You'll also notice that when that happens you have to lean your upper body to get your hips to move into the turn because they are being blocked by the a-framed stance leg. That puts you momentarily out of balance and delays the start of your tipping. SFDDS is a more accomplished skier than I am but this is visible even to me, as is the slight A-frame that geoffda mentioned and that Toddw may have noticed. geoffda wrote: Work on power releases from Essentials, one arc to a stop at a time. Your task is to ski your feet back together by the time you come to a stop... Remember kids, you don't need a wide stance to build large tipping angles! I'm curious why the instruction here doesn't include some basic Inside Foot Management drills at very slow speeds; e.g., Super Phantoms & TFRs with intense focus on pulling the Free Foot toward/against the Stance Foot actively & continuously throughout the turn. Wouldn't this reinforce a narrower stance through transition without relying on momentum for balance? Geoffda knows that I'm no coach, so this is intended as a naive question and not in any sense a disagreement with his guidance. DougD wrote: I'm curious why the instruction here doesn't include some basic Inside Foot Management drills at very slow speeds; e.g., Super Phantoms & TFRs with intense focus on pulling the Free Foot toward/against the Stance Foot actively & continuously throughout the turn. Wouldn't this reinforce a narrower stance through transition without relying on momentum for balance? In high angled turns with large amounts of vertical separation between the feet, that separation must be minimized prior to releasing. Otherwise, the vertical separation gets instantly converted to horizontal separation and an overly wide stance (with all of the attendant problems that introduces at release) is the result. Proper free foot management in such a turn would result in the heel of the free foot being tucked against the inside of the knee of the stance leg at the turn apex. While the free foot must still be managed and held back throughout the remainder of the turn, doing so doesn't contribute to bringing the skis back together. It is actually the stance leg and foot that must be managed to allow the stance ski to track back together with the free ski. 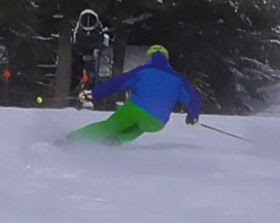 This is what is missing in SkiFastDDS's skiing and Power Release drills are the best way for him to get the hang of flexing and tipping of the stance leg/foot to avoid the wide-stance-at-release problem that he is encountering. Thanks, Geoff! You just gave me an "aha!" moment. Before starting PMTS I made high angle turns (for me) with big vertical separation through the apex, free foot tucked neatly against the stance calf or knee, depending on the angle. But something was missing. Releasing and transitioning into the next turn was less smooth, less controlled, physically harder and sometimes scarier than I would have preferred. As I recall, I needed to force my upper body across the skis to get inside the new turn. Your explanation just shined a spotlight on the key PMTS movement I was missing. To reduce that big vertical separation I wasn't flexing my stance leg into the bottom of the turn... I was holding the stance leg straight and extending my free leg to match it. At higher speeds this is HARD, it doesn't release the skis and it leaves one standing straight-legged in transition. With no flexibility or tipping range, the only way to get into the next turn was to push off and dive. That old extension bugaboo, learned in just two TTS lessons from Wedge to Stem Christie in 1986, was still hobbling me decades later in high speed carved arcs. Of course Harald explained all this perfectly in Expert Skier 2, Ch. 7. I'm trying to do PMTS in the correct order and I'm not up to Power Releases yet (recently nailed s-l-o-w TFRs and mixing them randomly with OFRs... WRs next). But insights like this get me pumped for the progress that's certain to come. I can replay old turns in memory and imagine how changing a few key movements (that I'm now drilling constantly) would have worked better. Apologies to SFDDS for the digression and thanks again Geoff. Also see Essentials p. 114 "When Do We Flex without Releasing?" and the description of Power Releasing in the same chapter (Flexing and Extending). As Geoff and Max have pointed out in previous posts, this is a technique for high angle carving, and not necessary for all turns. CA isn't the SMIM because increasing CA won't address the issue of the wide stance at transition. I hope my MA is ok for you. It’s my first time using this format as Oberules used this on me. No, the stance needs to narrower. The feet need MORE pull back. The inside foot needs MORE pull back. There is on CB on the stance foot for both sides but weight is more on the inside ski because of wide stance. There is evidence of CA on the right stance but not for the left stance. Yes. Shows more on the right stance than the left. Yes. I think you lose CA when you turn to the right sometimes. Right leg seems ok at the moment, I am not concerned . Would like to do something with the left foot, seems slightly bowed to me, I would it to be tipped in so that CB/CA will be easier for you on turns to the right.